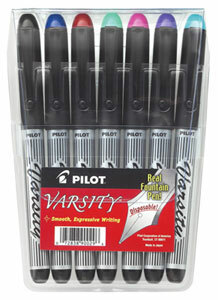 Order your Pilot Varsity Disposable Fountain Pens 7 Pack today from FahrneysPens.com. Fine Pens, Refills & Luxurious Gifts – great prices & fast shipping. Pilot gives you a new fountain pen color for every day of the week! The Pilot Varsity disposable fountain pens are fun to use and carefree - no refilling or inky fingers. The pens have a sturdy metal, easy flowing nib and a semi-transparent barrel to view your ink level. It's a great set to introduce yourself or others to the joy of fountain pen writing and is suitable for all ages. You get seven colors: black, blue, pink, red, purple, green and turquoise, all packed in a clear plastic pouch to take them wherever you go! The quality is good, but I would like to be able to order the ink color that I like as a pack. I can not use all of the colors in my work. For everyday use, this is the fountain pen for me. I recommend it to both beginning and long-time fountain pen users.